Superb service, contacted me to say that I may have got one of the label details wrong and did I want to check before they went ahead with the order. They were indeed correct, I had made a mistake. This saved me a lot of hassle. Will defiantly use RM for all our future needs. Hard to get service like this these days. Outstanding service from RM, no need to go anywhere else. Good quality discs and clear engraving. Awesome service, ordered 200 or so engraved discs on Friday and they were on site Monday. We will be ordering all future labels through RM. As always, RM have delivered a good product in a quick time frame. As a regular customer I would whole heartedly recommend them. 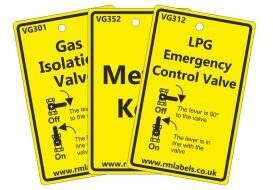 P J Price Ltd have been using R M Labels for many years without a glitch. The service and turnaround time is second to none and their increasing product range helps us keep ahead of our field. 100% recommended. A quick and cost effective solution for marking up pipework that does not require full banding. 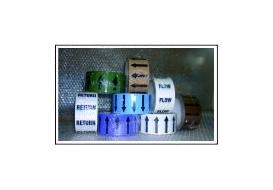 There is a large range of standard self-adhesive pipe markers to choose from and each marker has an arrow either end allowing you to cut off one arrow, leaving the remaining arrow to indication the direction of flow. You can also add your own text to the pipe markers. Available in three sizes to suit all pipe diameters. Discounts are offered on large quantities. The Water Pipe Markers are colour banded for water from the Public Water Supply or Any Other Source and for Potable or Non Potable Water. Ideal if you need to mark up pipework with full colour banding, Each piece of banding is available in three sizes to suit all pipework diameters and is long enough to wrap around the pipe. The banding comes with descriptive text viewable from any direction and includes directional arrows, saving time building up full banding with individual rolls of tape. Discounts are available when ordering large quantities. All of the Pipe Banding colours comply with the BS1710 2014 requirements. 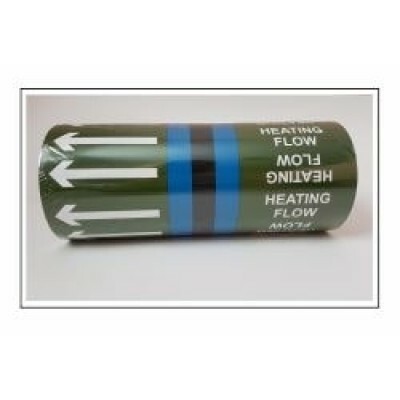 A cost effective way to mark up large areas of pipework. 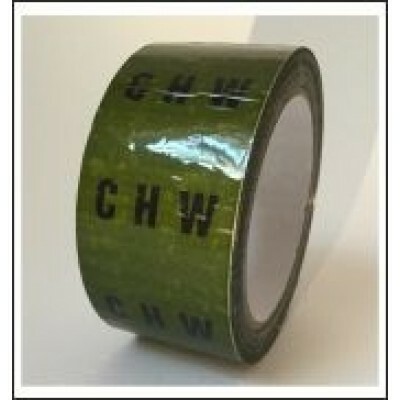 Choose from the comprehensive ranges of 50mm wide text tapes and coloured Pipe ID Tapes. The coloured tapes are available in three sizes and can be used together with the text tapes and directional arrow tapes to create full banding to the British Standard requirements. 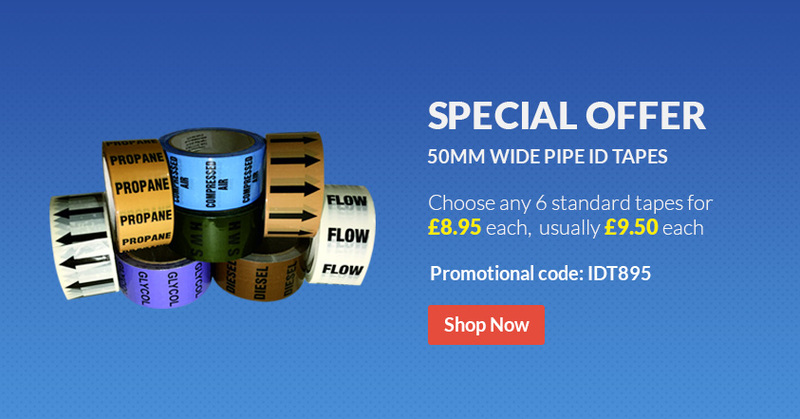 All of the colours for Pipe ID Tapes comply with the BS 1710 2014 requirements. Produced using a high quality traffolyte engraving laminate, these products are hardwearing and ideal for use in commercial situations such as boiler houses and plant rooms. The standard 42mm diameter discs come complete with chrome plated fixing chains and are ideal for marking up valves, other disc sizes are available. The engraved labels are available in any size and come with screwholes or a self-adhesive backing. These credit card sized durable plastic labels are suitable for domestic use. 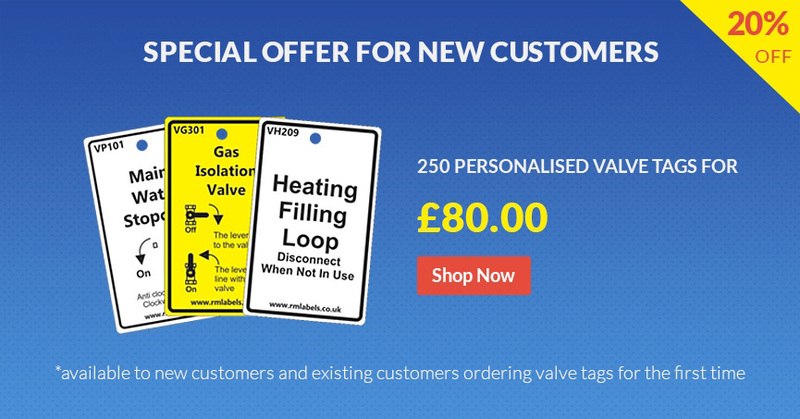 There is a complete range of standard tags for marking up all of the system's pipework and valves, including tags for plumbing, heating, oil, gas, solar and reclaimed water. Each tag comes complete with a plastic cable tie.